Ario Date Co is a leading Date manufacturer and exporter in Iran. We supply and export Piarom (Maryami) date with the best quality and competitive price. Piarom date (Maryami) is a commercial date managed to attract most of prominent international markets. Shelf Life: At room temperature about 18 Months, under interim fumigation. Used pitted or UnPitted for direct consumption especially as nuts with shelled nuts. Used for diabetic people because of its low sugar. Piarom Date is one of the most tasty and delicious semi-dried dates in the world that is cultivated in southern city of Iran: Hajiabd in Hormozgan province. Piarom palm is cultivated mostly the mountains and irrigated basin areas. It should be noted that there are 40 kinds of dates in Hormozgan province which the most cultivated dates in the various areas of the province are Piarom, Mordar Sang, Zard, Allmehtari, Mazafati and etc. The dates are grown organically and there is no chemicals in the harvest process. The thin and soft texture of the date has a dark brown color and has meaty and succulent flesh. Piarom Date is a commercial date which due to having high quality and consumers’ satisfaction it has become the special export date! This production has managed to attract most of prominent international markets. Piarom Date is full of protein and other mineral substances and has high quality nutritious value! Cirueie, Tarom, Tazraj and Daragah are the villages in the HAJIABAD city in which the date is cultivated in! This date fruit is considered as the most expensive date in the world and Hajiabad city is the only area which cultivate Piarom Date. PIAROM which is called chocolate date in the international markets is the best export date in Iran. The date due to high amount of fructose is suited for those who are suffered from diabetes. The doctors have recommended this date because it has a load of fiber which is very beneficial for digestive system and works as laxative food! PIAROM Date is also a rich source of potassium which is necessary for preventing high blood pressure and strengthens the nerves! Moreover, the date has high amount of magnesium that is effective for muscles and also nerves! The date has more various packaging compared with other date fruits, its harvesting is done once while other date fruits’ harvesting is gradual. The most exquisite species of dates are produced in Iran. The fruit has a large variety and more than 400 varieties of the fruit, some of which that are acclaimed worldwide, are produced in the southern, southwestern, and southeastern palm groves of Iran. The Piarom dates are one of the best and richest dates in the world, which just grows in Iran. This semi-dried date grows in Hormozgan region. Its color is Brown- black and the skin is fully-cling to the flesh so it has a nice appearance as a result of cleansing process. Those who once have consumed turned into its permanent customer for its very good taste and desirable appearance. According to the archaeological evidences, the palm planting was prevalent in Iran near the former Shoosh at the time of Islamic civilization about 6000 years. At the time of Sassanid era, date palm was found abundantly in the southern areas of Iran. Number of date varieties in the World are 4000 and the number of varieties in different regions of Iran is around 400 varieties. The differences between these varieties are in terms of size, type, color, water, sugar levels, shapes and sizes which depend on the type of soil, water, air and moisture in cultivation. The date production of each region and the main figures of exports are important. Some of date varieties such as Shahani, Mazafati, and Kabkab are have the best qualities of dates in the world. Piarom is one of dates that grows in Hajiabad city of Hormozgan province in southern Iran (one of the 31 provinces of Iran). The Hajiabad city is located about 100 km north of Bandar Abbas (capital of Hormozgan Province) and is best known for its citrus products. This town is settled in the northern point of the Hormozgan province at the end of the Zagros Mountains, Jabbar (birding area). This date is one of the most delicious semi-dried dates in the world grows in this area. Piarom Date is one of the tastiest and most delicious semi-dried dates in the world that is cultivated in southern city of Iran: Hajiabd in Hormozgan province (more than 95% of Piarom date is produced in Hajiabd). Piarom palm is cultivated mostly in mountains and irrigated basin areas. 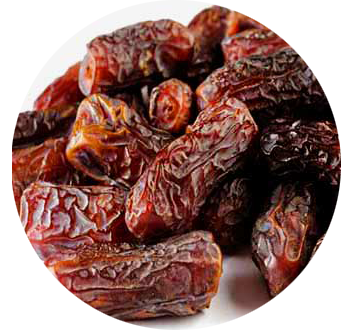 Piarom's date moisture is Less than other types of dates (under %15) and figures are considered semi-dried. So the shelf life obviously is about 18 month (1 year and half) under interim fumigation and room temperature. Piarom date color is black- Brown and the skin is fully-cling to the flesh. Piarom (Piarum) are long, slender, oval, nearly black, soft and also bigger than other dates in Iran. Its surface skin is very thin and fully-cling to the flesh makes it delicious date. Hajiabd's Piarom date is exported in two types of Pitted and un pitted. Piarom date has best tasting varieties of dates, because this date taste is sweet and has a unique delicious and indescribable taste. The Piarom date harvesting time is usually around Middle of September. Our company is always offering high quality products and most favorable service for our buyers, we take quality as important as service. Piarom date’s lifespan is within 2 years out of sun (keeping temperature 10 to 20 centigrade degree). Vitamins (like vitamin A, vitamin B complex, vitamin C and etc.) and sugars (like fructose and etc.). Fruit Calories are made up of mostly simple carbohydrates, some proteins, and very little fat. 100 grams of dried- date Piarom has about 300 calories and is composed of about 70% carbohydrates, 2.2% protein, 0.6% fat while fresh dates Piarom contain about 160 calories. The best food: Dates are sweet and delicious and are the best food for men too. Diabetes: The Piarom Date due to its high amount of fructose is suited for those who are suffered from diabetes. The doctors have recommended it because it is full of fiber which is very beneficial for digestive system and works as laxative food! Cancer of colon and stomach: The results of investigation show that the date eating prevents cancer of colon and stomach. Asthma: It is useful for some breathing problems, especially for asthma. Blood pressure: Piarom date also is a rich source of potassium that is so necessary for preventing high blood pressure and strengthens the nerves. Muscles and nerves: the Date has high amount of magnesium that is effective for muscles and also nerves. Date fruit seeds have been demonstrated to possess high antioxidant activities due to their high content of flavonoids and phenolic compounds. The Piarom date seed powder is also used in some traditional medicines since it is useful for eyes, especially for cornea. Date seeds oil is suitable for soap and cosmetics. Date palm seeds contain 0.56–5.4% lauric acid. They can also be processed chemically as a source of oxalic acid. The seeds are also burned to make charcoal for silversmiths, and can be strung in necklaces. Date seeds are also ground and used in the manner of coffee beans, or as an additive to coffee. Experimental studies have shown that feeding mice with the aqueous extract of date pits exhibit anti-genotoxic and reduce DNA damage induced by N-Nitroso-N-methylurea. Iran is one of the leading countries in date production and export in the world. Date is harvested on 180,000 hectares of groves in Iran. Iran shares 20 percent or so of the world date production and is the largest date producer in the world. Dry or soft dates (Piarom, Mazafati, etc.) are eaten out-of-hand, or may be seeded and stuffed, or chopped and used in a great variety of ways: on cereal, in pudding, bread, cakes, cookies, ice cream, or candy bars. The pitting may be done in factories either by crushing and sieving the fruits or, with more sophistication, by piercing the seed out, leaving the fruit whole. The calyces may be mechanically removed also. Surplus parts are made into cubes, paste, spread, powder (date sugar), jam, jelly, juice, syrup, vinegar or alcohol. Piarom is one major species of fresh dates with huge annual yield. The largest portion of this product is consumed in domestic markets, but due to its production growth during the recent years steps have been taken for exporting this product. Our company exports its products to all over the world including UAE, Iraq, India, Russia, Ukraine, Pakistan, Europe and other countries. Ario Co is one of the most prominent and the largest supplier of the Date Fruit in Iran. Ario Co was established in 1985 in order to provide and supply various fresh kinds of the Date Fruit such as pitted, fresh and dried Dates in Iran and even abroad. The main purpose of the Ario CO is providing and supplying high quality productions, customers’ satisfaction and consequently a useful and efficient trade in the world. According to the quality varies from 4-7 USD per each Kg.